Adam Deacon, Samuel Anderson and Yasmine Akram in The Retreat. Images Craig Sugden. 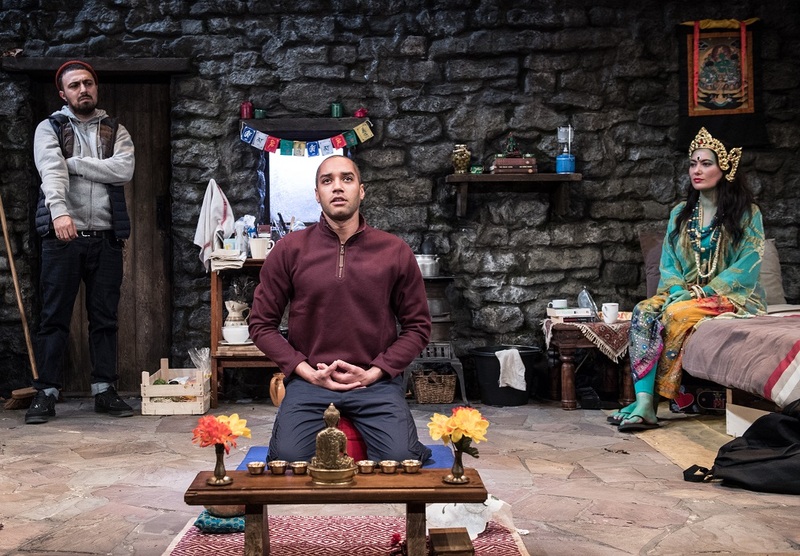 Peep Show co-creator Sam Bain’s first play, The Retreat, opened at London’s Park Theatre last night and carried huge promise from the outset. 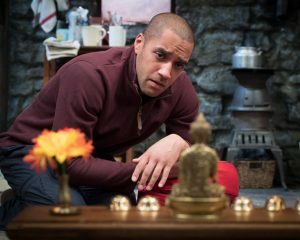 Luke (Samuel Anderson) has left the London rat race to “find himself” at a Buddhist retreat in the Scottish Highlands. The phrase “you take your problems with you” adopts human form, however, when Tony (Adam Deacon), Luke’s brash, crass older brother and lodger arrives uninvited, armed with cocaine, garage music and a Toblerone. As the brothers thrash out their childhood in Luke’s rustic cabin, periodic interruptions from retreat manager, Tara (Yasmine Akram), start raising questions about what Luke’s true motivations are. Directed by Kathy Burke, The Retreat is riddled with contradictions. On the outside, a comedy about a city boy leaving his job to join on a Buddhist retreat (a “gap year 15 years’ too late” as Tony puts it) could sound a little trite. And, joking aside, Tony is really annoying. Just relentlessly, spirit-crushingly annoying. To begin with, the humour is louder and more in your face than you might expect from the writer of Peep Show, the moniker of inner monologue and “Very British Problems”. As the drama wears on, the original posturing of “straight man” Luke to anarchic “funny man” Tony is turned absolutely on its head and then ripped to pieces. Meanwhile, Tara sways between crazy spiritual-girl caricature, cynical hustler and voice of reason. Ultimately not a moral compass hangs between the three of them. The Retreat is a slow burner; loud but thoughtful, with a violence and nihilism at its core. Beneath the barrage of one-liners and slapstick comedy, the characters are subtle, well developed and strangely believable. The promised critique of modern middle class hypocrisy and misappropriated Eastern philosophy happens; but then it cuts deeper, into something harsher, more personal and less fun. In the end, the question “What now?” is left to hang in the air. 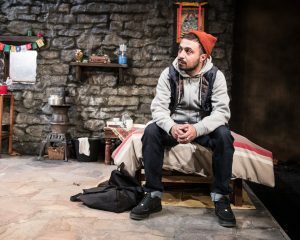 The Retreat runs at Park Theatre until December 2. Stage Review critic, Julia Ross, calls Sam Bain’s debut play, The Retreat, ‘a slow burner; loud but thoughtful, with a violence and nihilism at its core’.